Announcement Tinned Pineapple is two crafters who use our love of geekery and pop culture to make awesome handmade items, often times out of upcycled and repurposed materials! Check out the links in our shop to follow us on social media! Thanks so much for checking us out! And don't forget, we'd love to work with you for a custom order! Email us at tinnedpineapple [!at] gmail.com to talk about it! Tinned Pineapple is two crafters who use our love of geekery and pop culture to make awesome handmade items, often times out of upcycled and repurposed materials! Check out the links in our shop to follow us on social media! Really nice!! I just didn't realize how big it was, I thought it was smaller. But still happy with the product! Fast shipping. Very cool earrings. Look better in person. 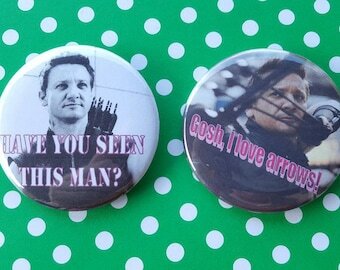 Great buttons! The sayings are perfect. Thank you! Making things you want out of things you don't. We got your fandom covered! Ringa looooooves buttons! Collecting, making, buying, selling, and gifting. She's big on decoupage, upcycling, crochet, and soap making. Her favorite fandoms are Marvel, Star Wars, and everything horror related. Althea loves cats and making fun toys for them to play with! Crafting she enjoys includes crochet, upcycling, painting, and soap making. Her favorite fandoms are Marvel, Star Trek, and Doctor Who.